This pastime may be in its last days as libraries become more and more electronic. Let’s by all means save print so people can write comments inside their books — I doubt whether annotations on an ebook can be saved to the library copy. I’ve never really liked annotating books, though I am quite happy when I come across a paved French or German book from my youth. Paving is what we called writing the English word above the foreign word to facilitate subsequent reading. Here’s a richly defaced library book. I regard the making of annotations in a library book is a form of exhibitionism. Making marginal comments in your own copy (not something I ever do — the furthest I’ll go is to pencil something on the back endpaper or a handy blank page back there) is obviously acceptable — after all it’s yours in a way which we are beginning to realize an ebook rarely is. Maybe we have to forgive the absent-minded professors among us, even if they may sometimes be more self regarding than absent minded. And of course years later these annotations may become valuable — after all the notes of genius make for permanent harmonies. 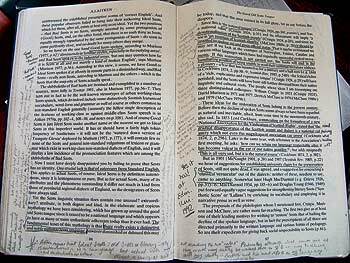 But marking up a library book is beyond selfish: even if you do hope to borrow the book again in a few years to reread it, what of all the intervening readers who have been forced to stop and study your lucubrations? I occasionally dip into the second hand market and can report that highlighting in yellow marker does not unfit a book for scanning into digital form. The scanner can see through yellow, but of course will faithfully reproduce those ball-point pen markings, as you can verify form looking at Google Books, fertile ground for a study of markings in library books. There you will also encounter the often prolific library identification stamps. And I really hate meeting those dotted underlines in a Kindle text which tell me that some other reader has highlighted that passage. What do I care what some other reader thought, I scream, as I plough on. Is this what social readers crave? Joe Orton was done for defacing library books: he got six months. His activity was motivated more by cultural politics than the expediency which drives the paver. The TLS of 19 December 2011 had an account under the heading Textual harassment.